MIT researchers have developed a low-cost, paper-based device that changes color, depending on whether the patient has Ebola, dengue, or yellow fever. The test is designed to facilitate diagnosis in remote, low-resource settings, takes minutes, and does not need electricity to read out results. The team described their approach Tuesday (Aug. 18) at the 250th National Meeting & Exposition of the American Chemical Society (ACS), updating the MIT announcement in February. Standard approaches for diagnosing viral infections require technical expertise and expensive equipment, says MIT researcher Kimberly Hamad-Schifferli, Ph.D. “Typically, people perform PCR and ELISA, which are highly accurate, but they need a controlled lab environment.” Polymerase chain reaction (PCR) and enzyme-linked immunosorbent assay (ELISA) are bioassays that detect pathogens directly or indirectly, respectively. Hamad-Schifferli and her team at the Massachusetts Institute of Technology, Harvard Medical School and the U.S. FDA use silver nanoparticles in a rainbow of colors. The sizes of the nanoparticles determine their colors. The researchers attached red, green, or orange nanoparticles to antibodies that specifically bind to proteins from the organisms that cause yellow fever, Ebola, or dengue, respectively. They introduced the antibody-tagged nanoparticles onto the end of a small strip of paper. In the paper’s middle, the researchers affixed “capture” antibodies to three test lines at different locations, one for each disease. To test the device, the researchers spiked blood samples with the viral proteins and then dropped small volumes onto the end of the paper device. If a sample contained dengue proteins, for example, the dengue antibody, which was attached to a green nanoparticle, latched onto one of those proteins. This complex then migrated through the paper, until reaching the dengue fever test line, where a second dengue-specific antibody captured it. That stopped the complex from going farther down the strip, and the test line turned green. When the researchers tested samples with proteins from Ebola or yellow fever, the antibody complexes migrated to different places on the strip and turned red or orange. Next, the researchers plan to produce kits for free distribution. “We’re giving people the components so they can build the devices themselves,” says Hamad-Schifferli. The kits will provide a flexible platform for making paper devices that can detect any disease of interest, given the right antibody. “We are trying to move this into the field and put it in the hands of the people who need it,” she says. Rapid point-of-care (POC) diagnostic devices are needed for field-forward screening of severe acute systemic febrile illnesses. Multiplexed rapid lateral flow diagnostics have the potential to distinguish among multiple pathogens, thereby facilitating diagnosis and improving patient care. Here, we present a platform for multiplexed pathogen detection using multi-colored prism-shaped silver nanoparticles (AgNPs). We exploit the size-dependent optical properties of Ag NPs to construct a multiplexed paperfluidic lateral flow POC sensor. AgNPs of different sizes were conjugated to antibodies that bind to specific biomarkers. Red AgNPs were conjugated to antibodies that could recognize the glycoprotein for Ebola virus, green AgNPs to those that could recognize nonstructural protein 1 for dengue virus, and orange AgNPs for non structural protein 1 for yellow fever virus. 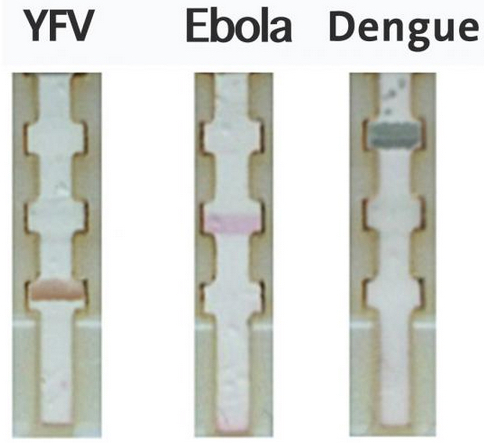 Presence of each of the biomarkers resulted in a different colored band on the test line in the lateral flow test. Thus, we were able to use NP color to distinguish among three pathogens that cause a febrile illness. Because positive test lines can be imaged by eye or a mobile phone camera, the approach is adaptable to low-resource, widely deployable settings. This design requires no external excitation source and permits multiplexed analysis in a single channel, facilitating integration and manufacturing.